The mighty Viking warriors are of course interesting figures, and with anything of interest there becomes many truths and also misconceptions. This is true with the Viking warriors, and we have some facts to help bring some myths and truths to light. While the reputation of the Viking warriors to be raiders and plunderers, the true fact is that they did not spend all their time stealing. In truth, the reality is that the Vikings were often involved in trades, both inland and overseas. Much trading was done in and around the many ports in Scandinavia, and even from town to town were various Viking and Norse tribes lived. The Vikings were also thought of as the worldwide traders of their era, they would trade in many countries and even in multiple modern continents. For such an often considered barbaric race, its interesting to note that the Vikings and their warriors were highly religious people. Their primary god was Odin, who was the god of many things, including war, life, justice, death, poetry and wisdom, and was the ruling god of the other Norse gods. Probably of great importance to all Viking warriors was the idea of Valhalla, a hall in the realm of the gods, Asgard, and Valhalla was Odin’s home. A fallen Viking warrior would be promised entry to Valhalla and would dine with Odin himself, promise enough to probably remove fear from the hearts of the Viking warriors. If a mighty Viking warrior fell in battle, it was then common for them to be buried with many of their belongings. Treasure, trinkets, weapons and clothing were common. The Vikings believed in an afterlife, known as Valhalla, and of course a Viking warrior would need his belongings there. Not only were the Viking warriors fearsome on the battlefield, but an interesting fact is just how good a craftsman many Vikings were. Skilled in weapon construction, home and house construction and the Vikings also designed some of the most beautiful and intricately detailed ships known on earth. The detail and finesse in the tools and utensils the Vikings created shows great detail and a high level of artistic flair. The idea that Viking warriors were always raiding, pillaging and killing is just not true. 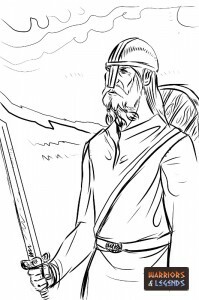 The real truth is that most of the time, Viking warriors were first and foremost farmers. Livestock and growing their own fruits and vegetables was the only way to survive in old Norse times. Viking warriors would have spent most of their life living off the land, and even when they travelled to foreign lands, the settlements they started there would have been built in a similar fashion as their settlements in Scandinavia. The stereotypical view of the Vikings and their warriors was of these blue eyed and blonde haired wild men, with long beards. The reality in this case probably matches the stereotype. The science behind this Viking fact is that skin and hair colour is determined by the amount of melanin in the skin and hair. The lighter the skin and hair means there is less melanin, which is what protects us from sunlight. So in cold countries with less sunshine, the humans have less melanin which allows them to absorb the sunlight more easily, and get the required vitamin D from it. Therefore with the cold and often harsh climate in Scandinavia it makes sense that many of the Vikings would have been blonde haired and blue eyed. A Viking warrior wearing a traditional Viking style helmet. A common misconception among old Norse warriors, it is in fact a myth that Vikings wore helmets with horns. The truth is that horns would be hard to come by, would not have helped in battle at all, and would have added extra weight to a helmet. The truth is that all Viking warrior helmets were typically rounded or conical in shape, and were designed to allow edged weapons to slide easily off the helmet, potentially saving the warriors life many times over. On their raids and adventures overseas, it was common for Viking warriors to take slaves from the towns and villages they pillaged. These slaves would be called thralls in old Norse society and lived on the lowest rung of the Viking society ladder. The thralls would later be used as home helpers, farming hands, or even sold or traded for financial gain.